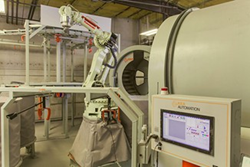 Pennsylvania Precision Cast Parts (PPCP) has completed the installation of two additional robotic dipping systems used in making investment casting ceramic shells with enhanced consistency and quality. Our new robotic dipping systems provide streamlined, continuous operation, which enables us to deliver highly reliable castings to our customers. 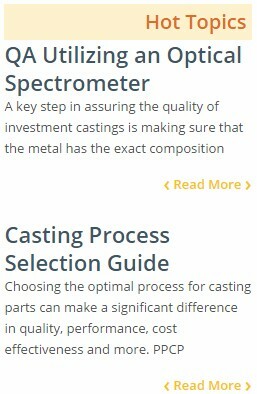 Pennsylvania Precision Cast Parts (PPCP), an industry-leading investment casting company located in Lebanon, Pa., has installed two additional robotic dipping systems that are used to make investment casting ceramic shells. The state-of-the-art equipment and computer controls enhance quality, consistency and efficiency through advanced automation. View the time-lapse video of the installation and operation of PPCP’s new robotic dipping systems. PPCP’s new systems were fabricated and programmed by KEA Automation and utilize advanced Kawasaki robotic arms. The versatile robotic arms have been specially integrated into the system by KEA Automation to meet PPCP’s specific needs and requirements. Each individual part made for PPCP customers will have its own unique program to control the robotic system. While production of a large majority of the parts PPCP casts will include robotic dipping, manual processes are also utilized when they are optimal for the specific application.